Searching S.B.Jain Institute of Technology Management & Research Assistant Professor Vacancy in November 2018? 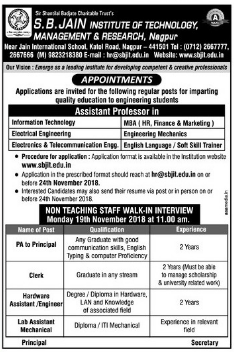 S.B.Jain Institute of Technology Management & Research, Nagpur has advertised in the LOKMAT newspaper for recruitment of Assistant Professor Plus Non-Faculty jobs vacancies. Interested and eligible job aspirants are requested to apply (for Assistant Professor only) on or before 24th November 2018 and walk-in (for non-faculty only) 27th August 2018. Check out further more details below. About College: S.B.Jain Institute of Technology, Management & Research (SBJITMR) is the initiative of Shri Shantilalji Badjate, who devoted his lifetime to the field of education. His dream to build a world class educational infrastructure led to the beginning of Sir Shantilal Badjate Charitable Trust, Nagpur. SBJITMR is an ISO 9001-2008 Certified Institute and is approved by AICTE (New Delhi) & DTE (Mumbai), is affiliated to Nagpur University (RTMNU) and is recognized by Government of Maharashtra. How to Apply: Interested and eligible candidates are requested to send application along with Resume, copies of certificates / testimonials and recent PP size photos to the email address provided here.